Ideal for various interior and exterior applications, the raw silk beige available with us are used in wall-cladding, roofing and flooring purposes. 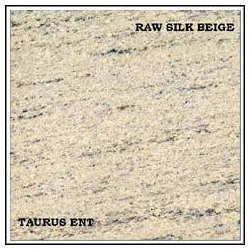 We offer these raw silk beige granite in different forms like blocks, slabs or tiles as required by the clients. The different finishes in which, our raw silk beige is available are flames, polished, honed, sawn (rough), sand blasted and bush hammered. Usage: Wall-cladding, roofing, flooring and all other interior & exterior applications.